The EOS M3 is Canon’s third attempt at designing a basic mirrorless camera. The original EOS M appeared in summer of 2012 and had an 18mp APS-C sensor. The EOS M2 appeared late the following year and added phase detection autofocus, Wi-Fi, and a few other touches. But here’s where things got strange: the M3 and the 11-22mm EF-M lens that came before it were not initially made available in the US. After having a difficult time establishing the EOS M in the US and other regions that didn’t exactly embrace mirrorless cameras, Canon limited the EOS M3 to mostly the Asian markets, where mirrorless cameras were more popular. Canon reversed this course six months later and brought the EOS M3 to the US market in what I’d call almost a tentative fashion. That turned out to be a good choice on their part, because the M3 has gained a small, but loyal following here. Let’s start our tour inside the M3 where we’ll find a 24.2mp APS-C CMOS imaging sensor coupled with the DIGIC 6 imaging ASIC. APS-C is the same crop area as Canon’s crop sensor DSLR models (Rebels), and indeed, this is basically the same sensor you’ll find in some of those models. These two chips give the EOS M3 the image quality capabilities of most of the lower end Canon DSLRs, indeed, slightly better than the lowest end models, which are only 18mp. ISO values from 100 to 12,800 are supported directly, and you can shoot in JPEG or 14-bit CRW raw files. The shutter is an electronic first curtain, mechanical second curtain model—good to keep shutter shock out of image results—that can be set from 30 seconds to 1/4000 second, and has a 1/200 flash sync speed. Continuous shooting can range to 1000 JPEGs at 4.2 fps, but only 5 for raw files. The camera has the usual bulb and self-timer modes you’d expect. The metering system uses the imaging sensor and can meter down to 1EV. Exposures can be set in 1/3 stop steps, with +/-3 EV exposure compensation available via a dial at the top of the camera. Despite its small size, the camera has both a built-in pop-up flash (GN16’/5m) and a hot shoe. As with the Canon DSLRs you have a full range of flash options, including second curtain sync and red-eye reduction. If you’re into video you won’t find much more than the basics, with 1080P/30/25/24, 720P/60/60 supported using MPEG-4 H.264-type compression. The camera has a stereo mic and a stereo microphone jack, but no headphone monitoring. Maximum recording time is the usual 30 minutes to stay within European import restrictions without triggering extra customs. For composing your images, you’ve got a 3” tilting LCD with 1.04m dots on the back of the camera. The tilt can go to 180° upward (so that the LCD faces the front of the camera) but only 45° downward. That LCD is also touchscreen capable, including a touchscreen shutter release capability. If you want a viewfinder, an optional EVF-DC1 plugs into the hot shoe and provides a 2.36m dot view of the world. The DC1 also tilts upwards if you want, but remember, it takes up the hot shoe, so larger or remote flash is out when you’re using it. The autofocus system is a hybrid approach. The camera uses phase detection pixels in the image sensor to help the contrast-detect autofocus system. Autofocus sensitivity only goes down to 2EV, so not as good as some rival systems. Overall, the M3 is relatively small (4.4 x 2.7 x 1.7” or 110.9 x 68 x 44.4mm) and light (12.9 ounces or 366g). That’s with an SD card in the one card slot and the LP-E17 battery installed. That battery is rated to 250 shots CIPA, a relatively low number, even for mirrorless cameras. The camera is made in Japan. This review is based on examining and using two samples, one of which was a loaner sample from B&H. For it’s size, the EOS M3 feels densely heavy. Some might not like that, but I happen to think that reasonable mass is good for a camera. The M3 has enough mass that you need to actually grip it well, but when you do the mass works towards keeping the camera steadier. In short, the heft of the camera works for me, but it’s not a camera that you want to handle casually (despite the available lens-based IS). More good news is that Canon has put a small-but-useful hand grip and thumb grip for the right hand position. Coupled with the soft material used, this is enough to get a solid hold on the camera with your right hand. At least for small to medium-sized hands. For a soap-bar style camera, the M3 manages to avoid the usual slipperiness that other companies don’t seem to understand is counterproductive to getting steady shots (it’s almost as if some camera companies believe that IS systems are perfect and thus they can skip basic ergonomics). The dials up top—mode dial and exposure compensation dial—are both resistant to casual changes, another thing that is often wrong on many lower end cameras but not the M3. You pretty much have to want to change the mode dial setting in order for it to move. And while the exposure compensation dial is exposed enough so that you can rotate it with your thumb, it doesn’t stick out in a way that means that any camera handling—such as moving the camera in and out of a pocket or bag—changes the setting. Personally, I prefer these “stiff” dial designs. Even the ring around the shutter release that controls the aperture or shutter speed in Tv, Av, or Manual exposure modes needs to be specifically moved by the user to change values; it’s another stiff dial. One very slight downside is that Canon put a fairly long delay into the mode dial when it is moved in order to show help on the LCD as to what mode is being selected (at defaults; but a delay is still there if you turn off the help). As you’ll see with other comments I make, the M3 isn’t designed to be a shoot-first, highly responsive camera. It tends to handhold the user a bit, and even small things like the menu design requires you move your finger from one button to another in order to back up, and there’s 11 menus to navigate. This isn’t a big thing, especially since the touch screen provides a much faster method through the menus. The tilting LCD goes all the way up to selfie mode (pointing to front of camera), but only down about 45°. Using the LCD is thus more optimized to working with the camera below you than above, though 45° is enough for most hold-above-your-head use, though the touch controls are awkward when doing that. The optional EVF is a bit of wart when mounted on top of the camera. The good news is that it can tilt to 90° upwards, has a great eyepoint for glasses wearers, includes a dioptric adjustment, and has 2.36m dots. It’s a little on the contrasty side and slower than some of the latest EVFs in refresh, though. Still, it is an interesting option for those that want to sometimes go compact, other times don’t mind the wart. Overall, the handling of the EOS M3 is straightforward, though note that a few things do at times seem a little sluggish to sophisticated users (e.g. “hold the thumbnail button to center AF sensor” really does mean you have to hold the thumbnail button down for a bit before the camera responds). Battery: Yep, this is not a camera where you want to be shooting without a fully charged extra battery in your bag. I got more than the 250 shot CIPA rating—probably because I didn’t do a lot of flash work—but I wouldn’t expect much more than the mid-300’s from a battery in most shooting situations, a fairly low number for photography enthusiasts. Buffer: You can shoot JPEGs almost unlimited at a bit over 4 fps. Raw mode, however, has a real buffer penalty: you’ll get a bit over a second of shooting, following by a delay as the buffer is cleared. Essentially consider it a 5 frame buffer if you’re shooting any form of raw. Focus: Canon’s not making any big promises here, and they deliver on that ;~). For casual shooting, especially of static subjects, I’ve got no complaints. Focus speed isn’t snap-instant, but fast enough. Face detect seems to work decently in this mode. Where the EOS M3 starts to have issues is with moving subjects, especially if you want to track them. If that’s your primary subject type, the Sony A6xxx series is probably what you should be looking at in a mirrorless camera of this size. It’s not that the Canon can’t deal with moving subjects. It’s that it is slow to lock in. And for tracking, well, I had okay results for slower, regular motion, not okay results with fast, erratic motion. I just don’t think you buy this camera for stopping motion. Be careful with “Continuous AF” (note that this isn’t “Continuous Servo AF”, but a different option). This has a tendency to eat battery in order to make focus snappier when you do press the shutter release, as the camera is actually focusing all the time it is on. Image Quality: I haven’t used all the Canon DSLRs, but I was struck by how similar the EOS M3 was to a few of them I’ve used. That shouldn’t be surprising, as the EOS M3 uses the same image sensor and processing engine as do the Canon DSLRs. Overall, the EOS M3 seems to have Canon’s usual dual Hue shift (green and red both shift a bit towards yellow). Adobe’s converters seem to be very friendly to the raw Canon files, and the EOS M3 ones are no exception. Dynamic range is not as extended as the Sony sensor cameras, but I like Canon’s linearity adjustments better than Sony’s in JPEGs, which makes this a bit of a wash for the JPEG shooter. Canon is dialing up noise reduction at higher ISO settings in a way that tends to mush detail, though. In raw files, there’s just more to a Sony A6xxx file in the shadows than in the EOS M3, pretty much at any ISO value. Moreover, there’s a bit more color noise in the Canon results than the Sony/Nikon results than I’m used to. This is pretty typical of the current Canon/Sony sensor differences. Sony EXMORs just have more cleanliness across a broader range than the Canon’s. Aside: many people think that more dynamic range is about highlights. For the most part, it is not. Additional dynamic range generally speaks to the deep shadows and near black. Highlights are determined by sensor well capacity, and proper ETTR exposure would leave highlights completely manageable, with lots of differential data (due to bit depth and how values are stored) to isolate highlight detail. Where dynamic range gains generally have been made in recent years is in noise propagation, which shows up mostly in the shadows. That said, there’s a point where more gains in the deep shadows don’t necessarily show up in images. That’s because if you reduce sensor noise enough, quantum shot noise becomes the gating element. However, don’t get too upset at the Canon’s slightly lower dynamic range than the Sony-based cameras. The EOS M3 has an APS-sized sensor, and it shows. You can definitely shoot at ISO 1600 to 3200 with this camera and get very good results. I actually found that I was finding more issues with the kit lens than with the raw file when comparing directly up against the Sony at high ISO values. The chromatic aberration of the kit lens was adding more problematic things to deal with than the small difference in high ISO noise, for example. Like most Canon DSLR images in ACR/Lightroom, the mid-range tonalities and skin tones tend to be very good out of the box. The deep darks (look at the kilt) block up a bit and the very bright highlights (person in white raincoat at left, tent in upper back) tend to lose detail. It’s bringing up the darks that starts to reveal the noise in ways you can’t deal with. Still, under these circumstances and at that ISO, the EOS M3 is showing a very DSLR-like result, which is what we expect. I suspect a lot of EOS M3 users would be looking at it as a substitute for a large, near-pocketable compact camera (e.g., the old Canon G series). The big DSLR sensor and modern imaging engine in the EOS M3 does exactly what you think: gives you Canon consumer DSLR-like results. With other lenses on the EOS M3 than the kit lens, I found myself liking the results even more. The 22mm f/2 quickly became my favorite on this camera, making for a pretty compact and capable 35mm equivalent that I could stick in my jacket pocket. Sure, you could buy a Fujifilm X100T to do the same thing, but the EOS M3+22mm puts up a strong fight, plus gives you lens flexibility when you need it. 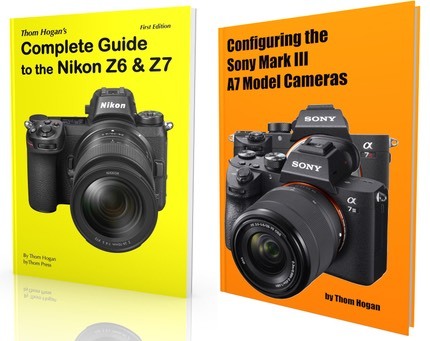 The M3 is up against the juggernaut of the crop sensor mirrorless products, the Sony A6300 (and now A6500). The Sony beats the Canon on a number of levels—built-in EVF, dynamic range at the sensor, focus speed, etc.—but the Sony also costs quite a bit more (US$1000 for the body as I write this, versus US$480). You’re paying for that extra performance and the built-in EVF, for sure. And yet, in many respects the EOS M3 holds its own when it comes to more casual photography. While it’s no speed racer when it comes to autofocus performance, for casual and static subjects the system is just fine. With 24mp on a well-proven Canon sensor, there’s plenty of ability to shoot in low light and to print large, even if it can’t quite match the Sony in terms of overall dynamic range in the deep shadows. The simpler approach Canon took—the menu system isn’t nearly as loaded with options as the Sony—makes for a simpler, more approachable camera. In most ways the EOS M3 lines up more closely to the Sony A5100, and there it provides a really close match, with the Sony being a little lighter and smaller but the Canon being less compact-camera like in its controls. Personally, I’m glad that Canon didn’t abandon their mirrorless lineup here in the US and returned with the M3. There’s a lot to like about this camera, even if it isn’t something I’d label “best” at any particular task. Instead, it’s a well-designed “very good” at most tasks you’d throw at it. Given the price point, that’s probably appropriate. The fact that Canon users can get the EF-M Lens Adapter and use their EF and EF-S lenses with full compatibility on the EOS M3 makes the EOS M3 a very interesting option for established EOS DSLR users. Indeed, if I were a committed EOS DSLR user I would strongly consider picking up an EOS M3 with the 28mm f/3.5 macro lens, the 22mm f/2 lens, and maybe the 11-22mm f/4-5.6 wide angle zoom. Why? Because then I’d have a very familiar pocket camera that matched up well with my DSLRs, and not just in features, but in image quality, as well. Overall, the EOS M3 is a very likable camera. The two things that keep it from being a complete winner are the lack of a built-in EVF and the autofocus performance. You can add an optional EVF for US$200 to get rid of the first problem, though it puts a slightly awkward accessory bulging up off the top of the camera, uses significant power, and takes up the hot shoe. The autofocus performance you can’t do anything about: the EOS M3 is best suited for more static subjects. 2018: this model is out of production and no longer available new. But used copies can easily be found. Also, check out the current M6 model.